U.S. Did Not Spy On French, Spanish Citizens, Says Spy Chief : The Two-Way Gen. Keith Alexander also said the information was collected in conjunction with European governments. 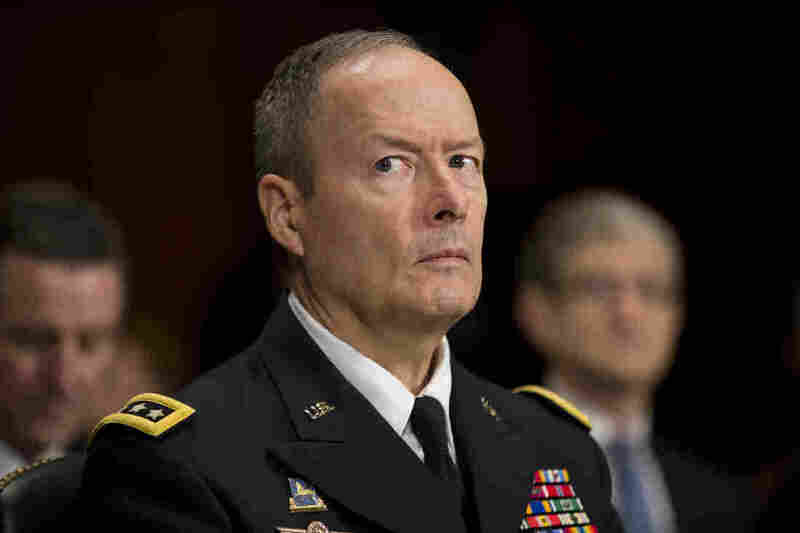 National Security Agency Director Gen. Keith Alexander is sworn on Capitol Hill on Sept. 26. The brewing scandal over allegations that the United States spied on millions of phone calls made by Spanish and French citizens took a sharp, surprising turn Tuesday. During congressional testimony, Gen. Keith Alexander, the director of the National Security Agency, said those reports, based on documents leaked by former NSA contractor Edward Snowden, were "false." NPR's Tom Gjelten reports that Alexander told the House Intelligence Committee that the documents were screen shots of a database and whoever had access to them did not understand what they were looking at. "The screen shots that show or at least lead people to believe that we, NSA or the United States, collected that information is false. And it's false that it was collected on European citizens. It was neither," Alexander said. What's more, Alexander also said that the communications were collected in conjunction with European governments. "The French and Spanish intelligence agencies have had extensive, long-running programs to share millions of phone records with the United States for counterterrorism purposes, according to current and former officials familiar with the effort." The Wall Street Journal, also basing its report on interviews with unnamed government officials, said the leaked documents put the U.S. in a bind. "The U.S. wants to correct the record about the extent of NSA spying but doing so in this case would require it to expose its allies' intelligence operations, the officials say, which could compromise cooperation in the future as well as ongoing intelligence efforts," the Journal reports.